President Donald Trump met with Brazil President Jair Bolsonaro on Tuesday in the Oval Office. 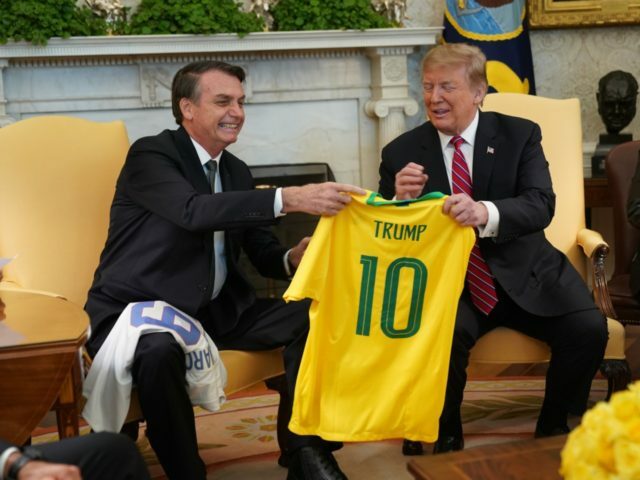 The two leaders exchanged soccer jerseys from their respective countries, as Trump recalled the greatness of legendary Brazilian soccer champion Pelé. Trump said he was “honored” to be compared to Bolsonaro, who was described as a “Trump of the Tropics” during his conservative populist campaign that propelled him to victory, shocking the Western hemisphere. The leaders expressed hopes for an improved relationship between the two countries, despite friction in the past. Bolsonaro thanked Trump for the meeting and praised his leadership.